Jockeys did a great job of avoiding the fallen jockey. Little did they know that they would have to avoid the mare when she jumped back in! 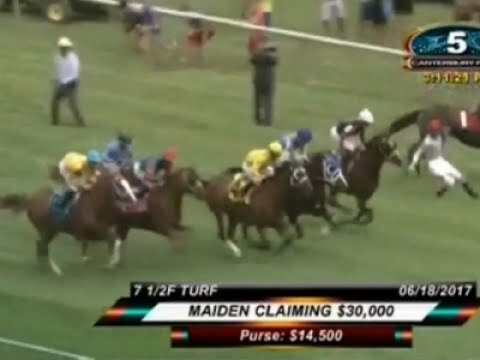 Princess took a sharp left toward the infield, losing her jockey again(!) and then jumped the rail. But that wasn’t the end of it. As the horses headed into the far turn, Tiz a Princess jumped the rail again into the path of the oncoming runners. The jockeys on the leading horses, Jareth Loveberry on Razipat and Leslie Mawing on Battle Chic, anticipated an incident and slowed up their horses, altering course to avoid Tiz a Princess. The rest of the field slowed up as well. Maybe Tiz a Princess should consider a career change. Steeplechasing might be a good choice.